BENTONVILLE, Arkansas, BENGALURU, India, May 9, 2018 – Walmart Inc. (NYSE: WMT) announced it has signed definitive agreements to become the largest shareholder in Flipkart Group (“Flipkart”). The investment will help accelerate Flipkart's customer-focused mission to transform commerce in India through technology and underscores Walmart’s commitment to sustained job creation and investment in India, one of the largest and fastest-growing economies in the world. Founded in 2007, Flipkart has led India’s eCommerce revolution. The company has grown rapidly and earned customer trust, leveraging a powerful technology foundation, including artificial intelligence, and emerging as a leader in electronics, large appliances, mobile and fashion and apparel. 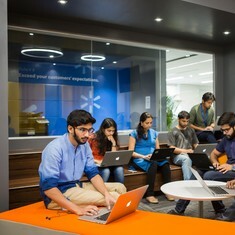 In a market where Walmart expects eCommerce to grow at four times the rate of overall retail, and with well-known platforms such as Myntra, Jabong and PhonePe, Flipkart is uniquely positioned to leverage its integrated ecosystem, which is defined by localized service, deep insights into Indian customers and a best-in-class supply chain. Flipkart’s supply chain arm, eKart, serves more than 800 cities, making 500,000 deliveries daily. In the fiscal year ended March 31, Flipkart recorded GMV of $7.5 billion1 and net sales of $4.6 billion representing more than 50 percent year-over-year growth in both cases. With the investment, Flipkart will leverage Walmart’s omni-channel retail expertise, grocery and general merchandise supply-chain knowledge and financial strength, while Flipkart’s talent, technology, customer insights and agile and innovative culture will benefit Walmart in India and across the globe. Walmart’s investment includes $2 billion of new equity funding, which will help Flipkart accelerate growth in the future. Walmart and Flipkart are also in discussions with additional potential investors who may join the round, which could result in Walmart’s investment stake moving lower after the transaction is complete. Even so, the company would retain clear majority ownership. Tencent and Tiger Global will continue on the Flipkart board, joined by new members from Walmart. The final make-up of the board has yet to be determined, but it will also include independent members. The board will work to maintain Flipkart’s core values and entrepreneurial spirit, while ensuring it has strategic and competitive advantages. To finance the investment, Walmart intends to use a combination of newly issued debt and cash on hand. Upon closing, Flipkart’s financials will be reported as part of Walmart’s International business segment. If the transaction were to close at the end of the second quarter of this fiscal year, Walmart expects a negative impact to FY19 EPS of approximately $0.25 to $0.30, which includes incremental interest expense related to the investment. Given the company’s financial strength, we anticipate the continuation of our current share buyback program while maintaining our strong credit profile. Supporting small business and ‘Make in India,’ through direct procurement as well as increased opportunities for exports through global sourcing and eCommerce. Among other initiatives, Walmart will partner with kirana owners and members to help modernize their retail practices and adopt digital payment technologies. The Flipkart Group is one of India’s largest e-commerce marketplace and includes group companies Flipkart, Myntra, Jabong, and PhonePe. This release contains statements as to Walmart management's guidance regarding the earnings per share impact of Walmart’s investment in Flipkart for the fiscal year ending January 31, 2019, and the subsequent fiscal year and as to the future operations of Flipkart, as well as statements by Walmart about its share buyback program and its credit profile. Walmart believes such statements are “forward-looking statements” within the meaning of the Private Securities Litigation Reform Act of 1995, as amended, that are intended to enjoy the protection of the safe harbor for forward-looking statements created thereunder. Assumptions on which such forward-looking statements are based are also forward-looking statements. Walmart's actual results may differ materially from the guidance provided as a result of changes in circumstances, assumptions not being realized or other risks, uncertainties and other factors, including: the closing date for Walmart’s investment in Flipkart; the level of Walmart’s investment in Flipkart from time to time; currency exchange rate fluctuations; changes in market interest rates; competitive pressures and other economic, geo-political, capital markets and business conditions, trends and events in India; changes in existing rules and regulations regarding foreign direct investment in the retail business in India; other changes in existing tax, labor or other law or regulations in India; and other risks, uncertainties and factors relating to Walmart’s operations and financial performance discussed in its filings with the SEC. You should read this release in conjunction with our Annual Report on Form 10-K for the year ended January 31, 2018, and our subsequently filed Quarterly Reports on Form 10-Q and Current Reports on Form 8-K. You should consider all of the risks, uncertainties and other factors identified above and in those SEC reports carefully when evaluating the forward-looking statements in this release. Walmart cannot assure you that the future results reflected in or implied by any such forward-looking statement will be realized or, even if substantially realized, will have the forecasted or expected consequences and effects for or on our operations or financial performance. Such forward-looking statements are made as of the date of this release, and Walmart undertakes no obligation to update such statements to reflect subsequent events or circumstances.